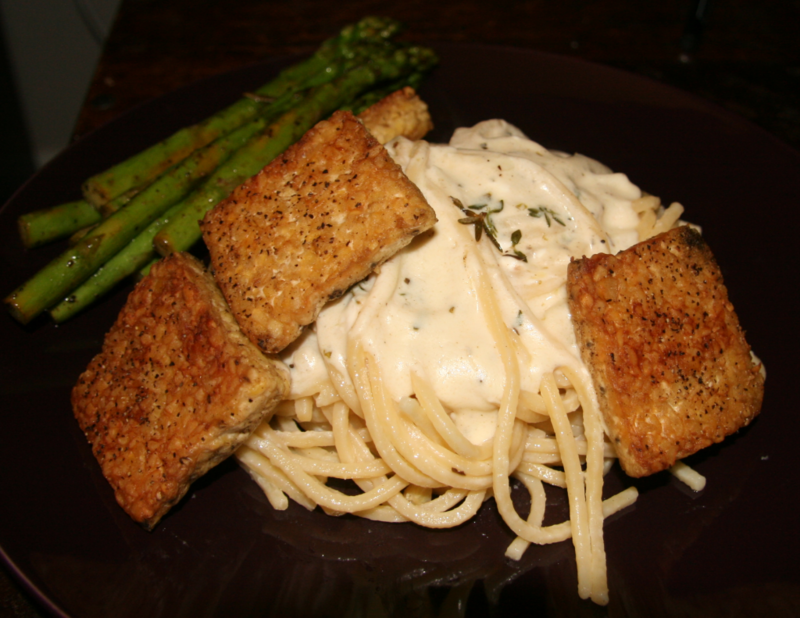 This is a perfect vegan cream sauce tossed with al dente linguine alongside crispy pan-seared tempeh (and a few vegetables so I don’t feel too guilty). Fyi, this also belongs on the top of #whatthefatveganseat. 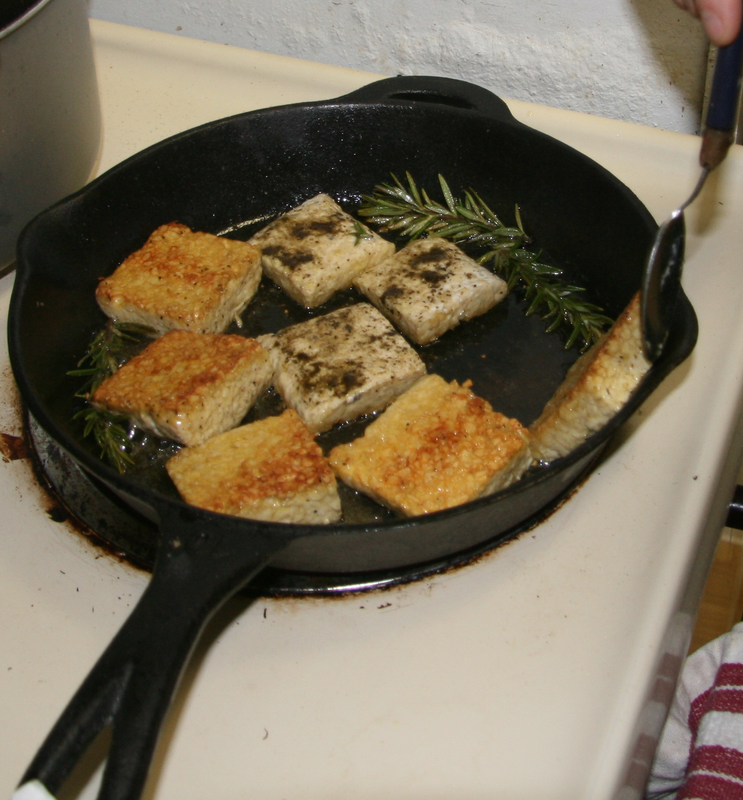 My resident pescatarian used to talk a lot about pan-searing fish, but recently he has switched to pan-searing Tempeh and he is quite good at it. Serve with pasta of choice, and something green! First get your pasta water on the stove, and preheat your oven to 350°. 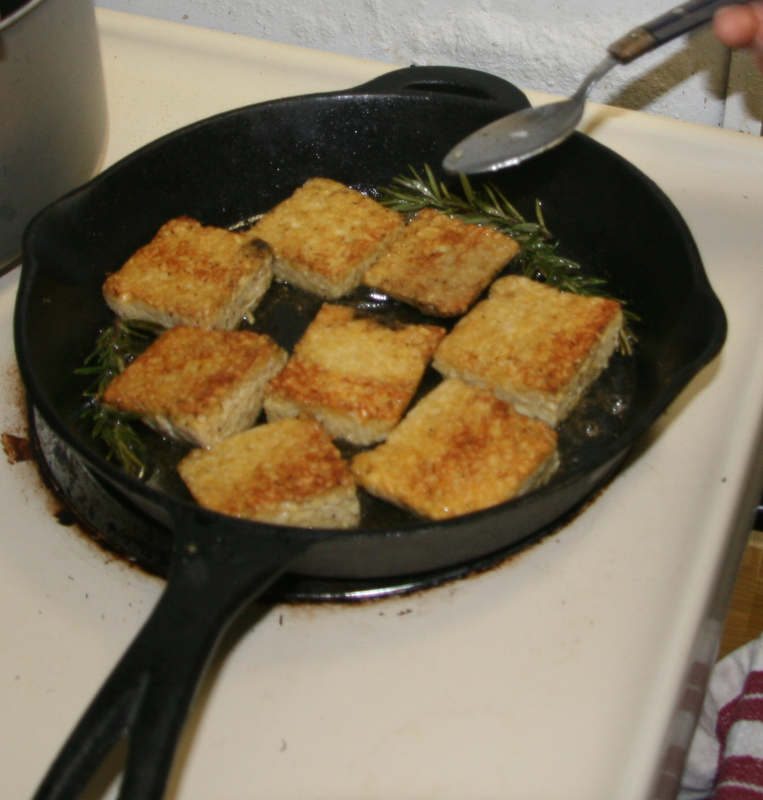 While the water is heating slice your Tempeh into 4 equal pieces, then cut those in half lengthwise so you end up with 8 flat squares. 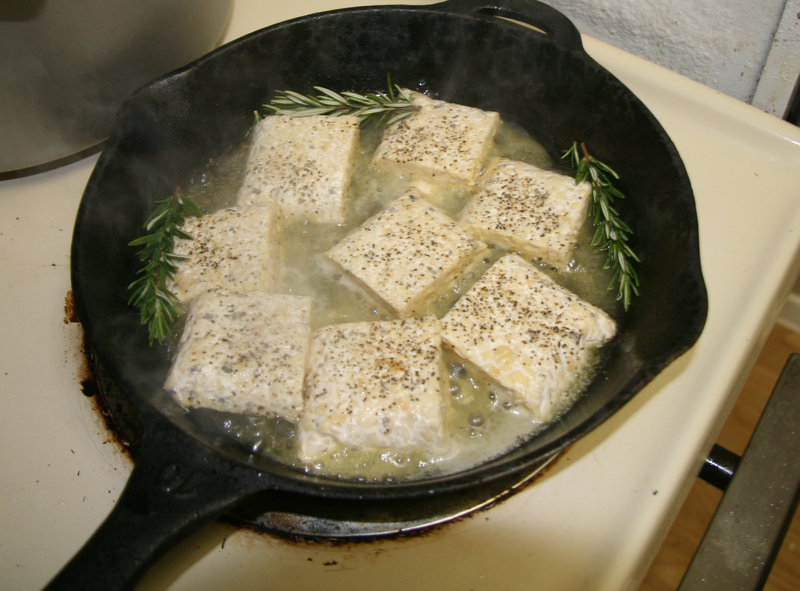 Soak the Tempeh in the salt water for 10 minutes. 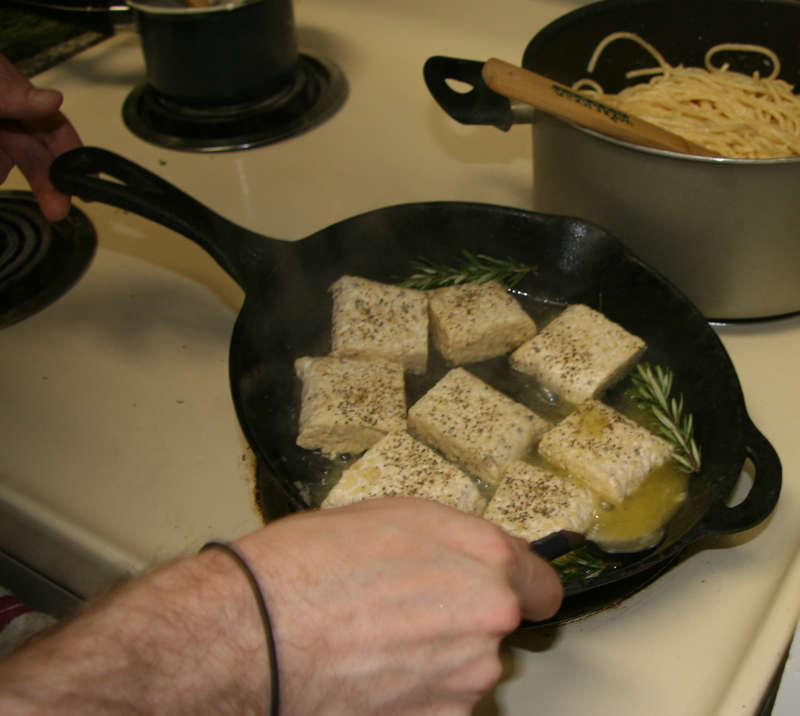 While the Tempeh is soaking, let’s start on our cream sauce. 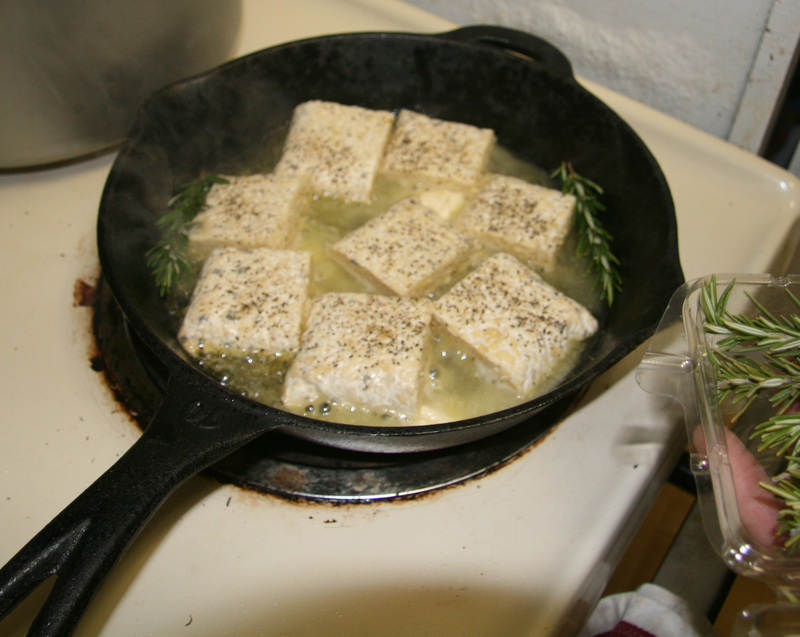 In a small sauce pan on low heat combine 2 tbsp earth balance, basil, garlic, marjoram, oregano, thyme sage, salt & pepper. Allow the earthbalance to melt and slowly simmer the spices for 2-3 minutes, depending on your stove you might need to turn the heat up or down just a bit. Do not allow this mixture to boil or scorch. At this point your water is most likely boiling, so toss in your pasta and cook until Al dente. Once the garlic becomes fragrant toss in the corn starch and mix well. 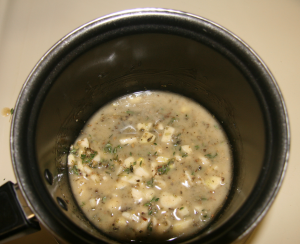 The mixture will quickly turn into a paste, at which point add your vegetable broth and cream cheese. Turn to medium heat and stir constantly. 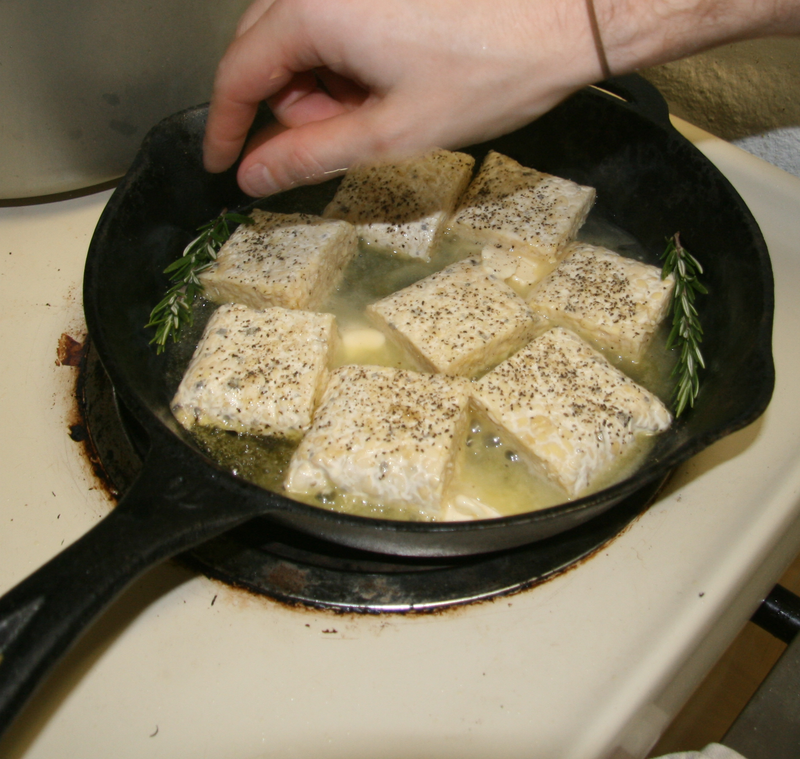 The cream cheese should melt into your thickening sauce and meld together into a perfect cream sauce. Set aside. 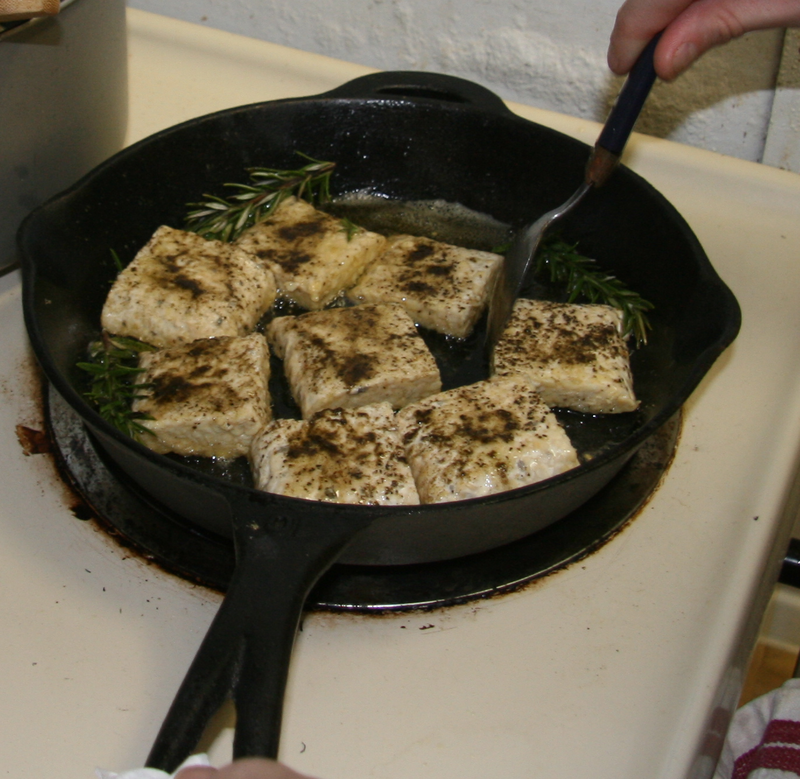 Remove the tempeh from it’s salt bath and spread out on a plate, sprinkle with pepper. If you have never pan-seared anything before it is pretty fun. 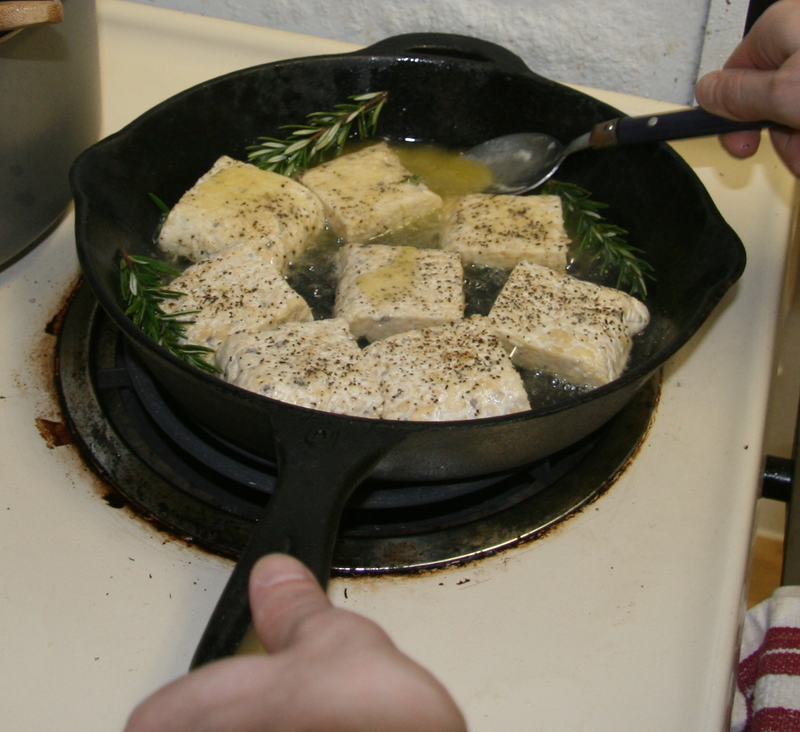 You want to start by warming your olive oil in an all-metal (including the handle*) frying pan on medium-high heat. 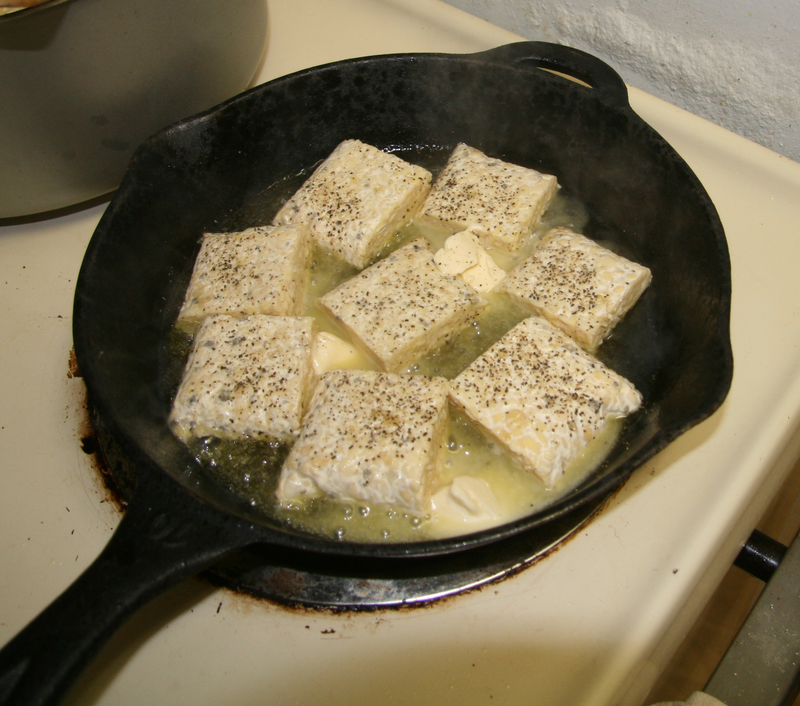 Place the Tempeh pepper side down on the pan. 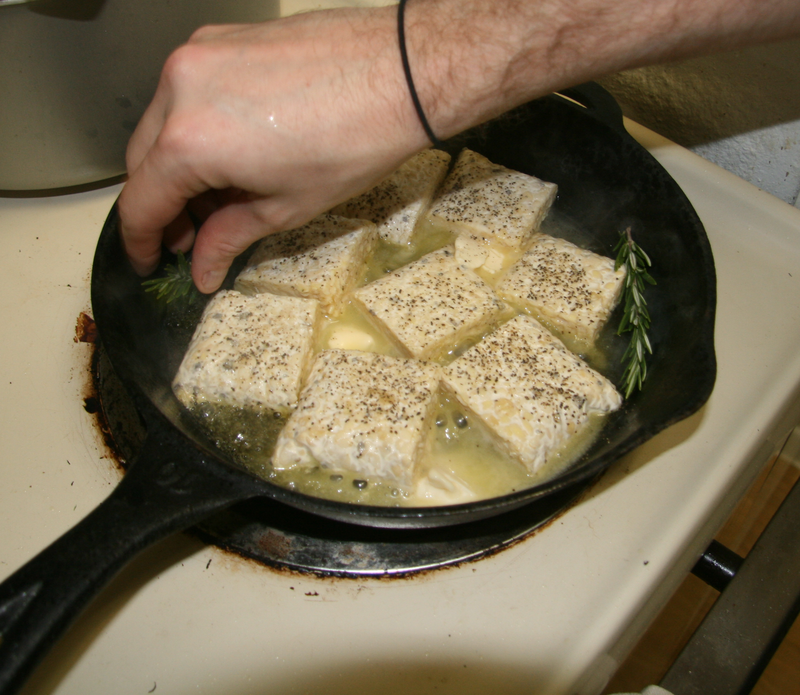 Add about a tbsp of earth balance dotted on either side, as well as the rosemary sprigs. 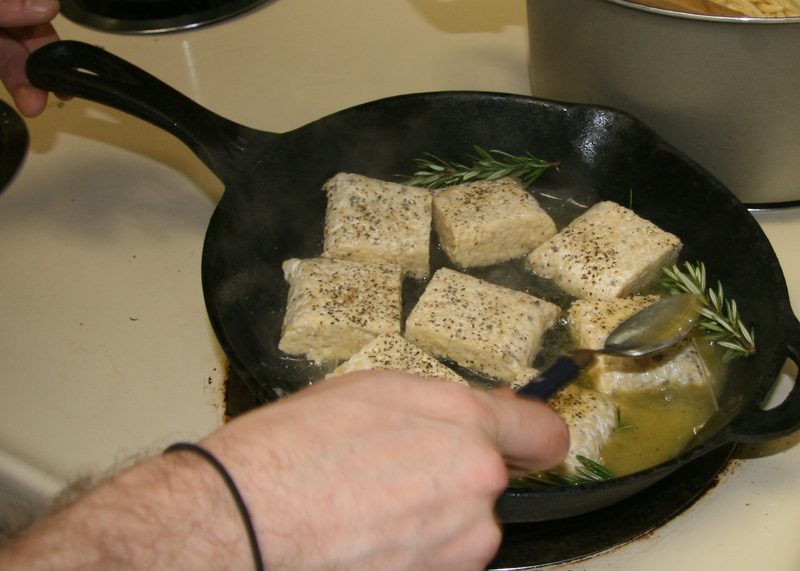 Sprinkle pepper on the top of the tempeh. 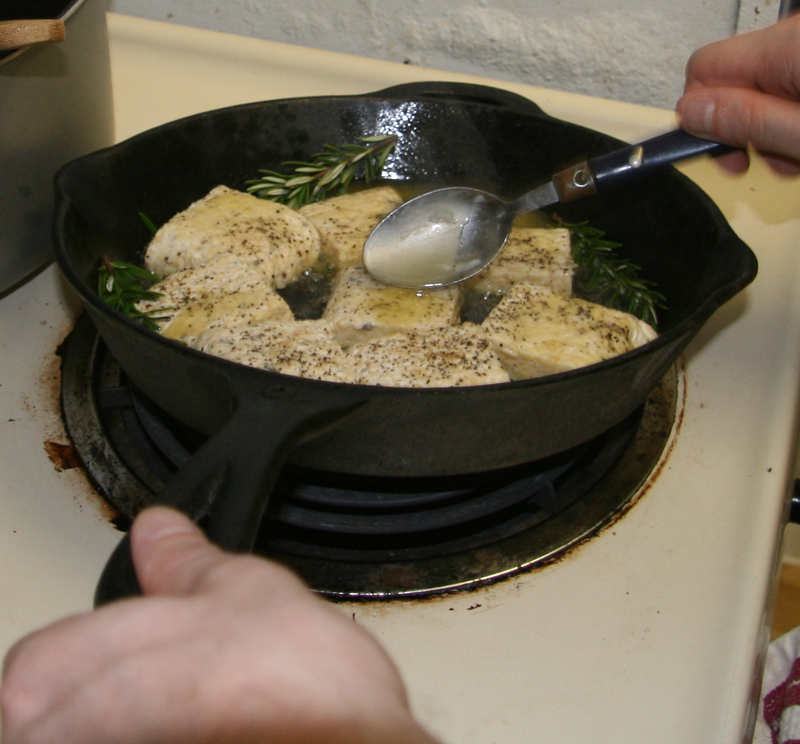 As the earth balance melts, tilt your pan so that it puddles around the rosemary. 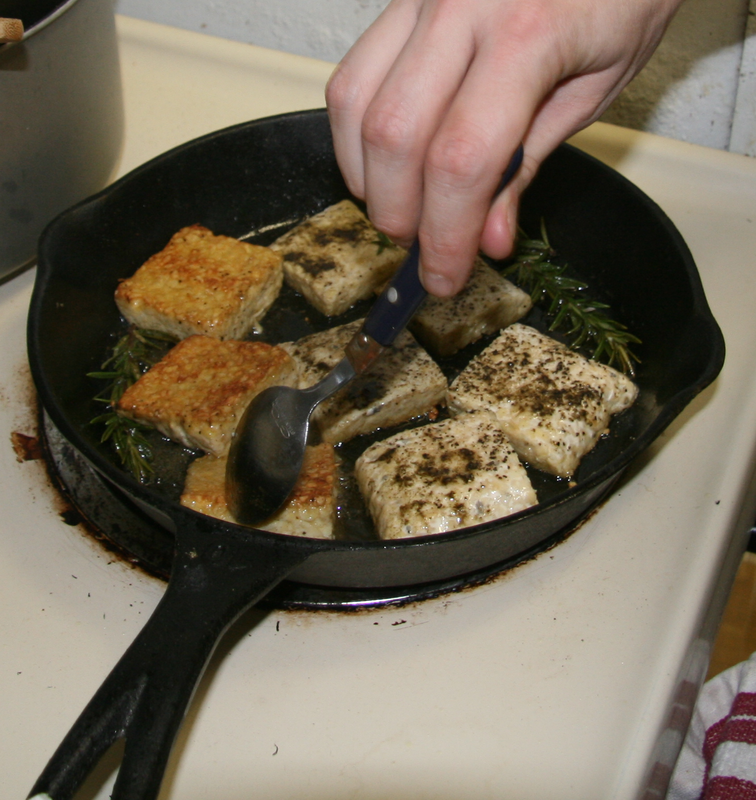 Use a large spoon to scoop up the now herb-infused butter and spoon over the cooking tempeh. 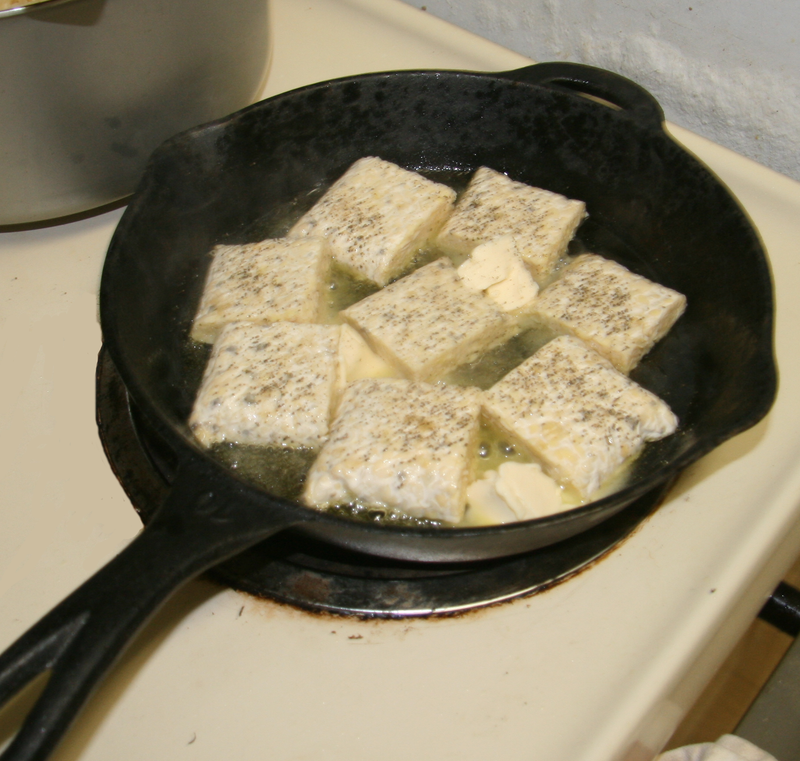 Continue to add dollops of butter when all has melted away. 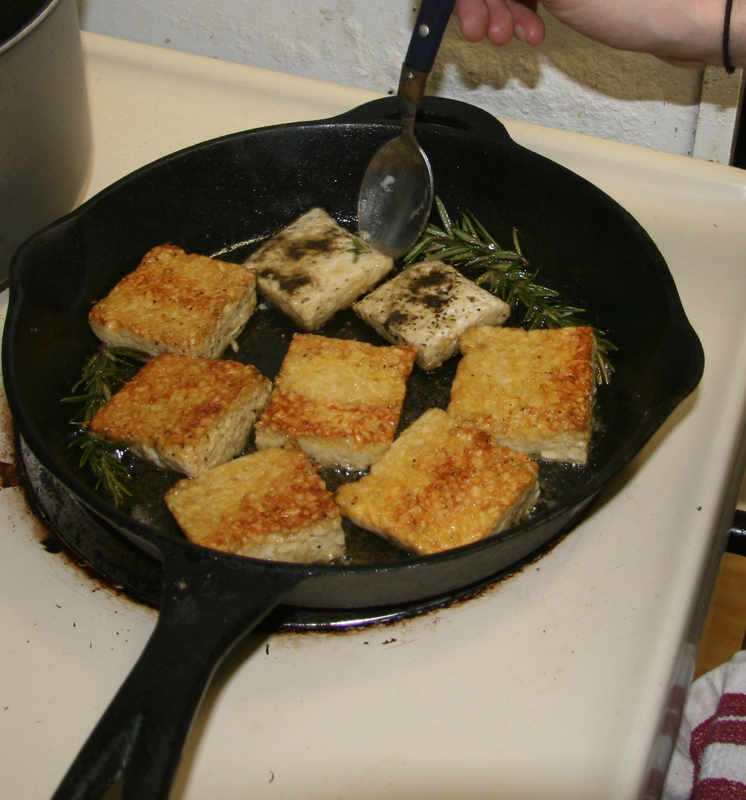 Once the bottom is golden brown about 4-5 minutes, flip the tempeh over and cook another 1-2 minutes. Place the whole pan in the oven and cook an additional 4-5 minutes. 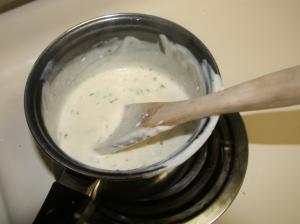 Once your pasta is drained, return it to medium heat and stir in 1/4 of your cream sauce to infuse it with the flavor. Add additional sauce when plating. 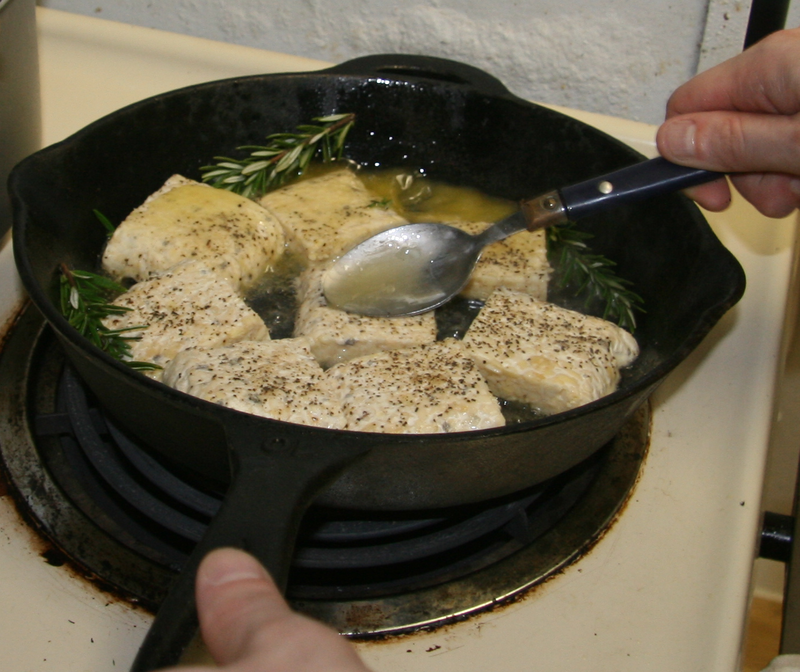 Carefully remove your pan from the oven and serve with your pasta, cream sauce and vegetable of choice!